We meet every week, and have a wide variety of projects. Something to suit everyone's schedule and inclination. Civitans are about Service, Knowledge and Fellowship, and we do all three. Our Motto is, "Builders of Good Citizenship" and we believe in it, and practice it. 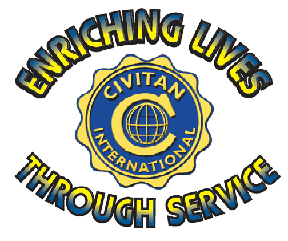 We promote Junior Civitans and sponsor the Civitan / Chad Payne Memorial Wheelchair Races. We provide a wide variety of services to our community, from ushering at our local coliseum, flying over 600 flags on national holidays and election days, and building wheelchair ramps for the homes of some of our handicapped neighbors and friends. We fry some, sure enough GOOD catfish. And that just scratches the surface. With a very large club, our members have a variety of projects to choose from, and can do what they enjoy doing. We are an ACTIVE club in an OUTSTANDING Organization.